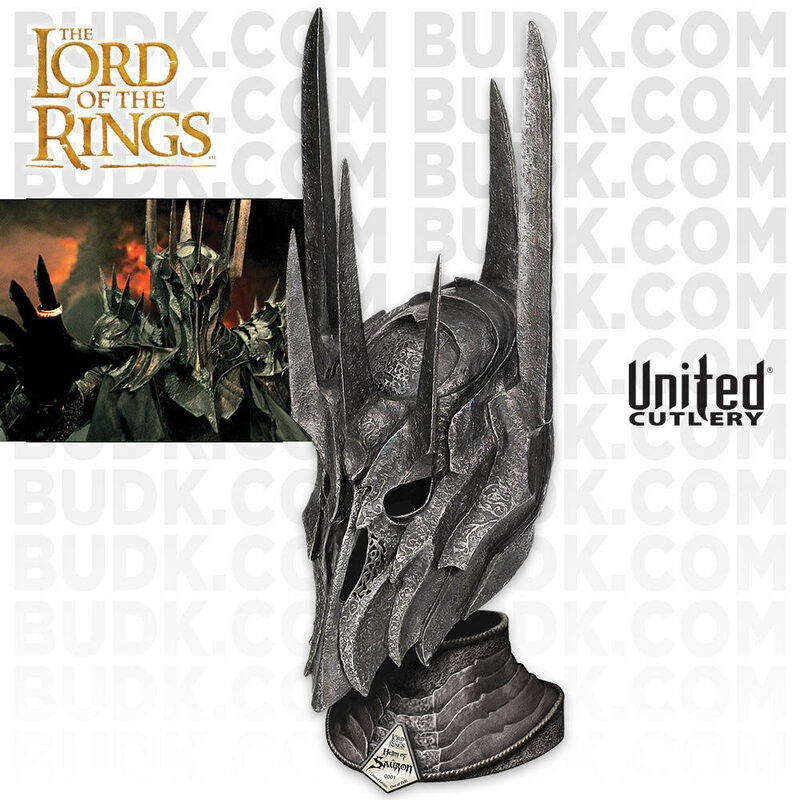 Helm of Sauron Lord of the Rings | BUDK.com - Knives & Swords At The Lowest Prices! The ominous War Helm of Sauron was worn by the Dark Lord Sauron in the Last Alliance of Elves and Men! This officially licensed replica has been meticulously recreated by United Cutlery to resemble the actual film prop from The Lord of the Rings trilogy. This limited edition collectible will not be reproduced when the 1,500 pieces are sold. This thing is totally Awesome. I know that's an over-used word, but this deserves it. It is huge, and quite heavy. I have a steel helmet, if this was made of steel, it would weigh a ton! You can wear it. It's got lots of padding on the top and in the back. In order to balance it on the display stand, it's a good idea to put it on and compress the padding some. I wouldn't call it comfortable to wear, but it looks amazing. And you can see, breath and speak with it on. The box makes mention of the Hobbit movie, so this could be considered a Hobbit version. Sauron does make an appearance in the second Hobbit movie and we'll see about the third. Find a space to display it, it takes up some room. Helm is huge, looks amazing, comfortable to wear, only downside is the stand is pretty loose and the helm is completely made of poly resin, it looks like metal but feels like cheap plastic when you touch it. The previous version was made of poly resin mix with metal to make it cold to touch, I wish they kept the quality with this one. Overall its a good product. Now when I first received this helmet I was surprised by how big it was. The box was huge and it took awhile to un-box it. I was disappointed that it was made of some type of plastic, buyer beware if your expecting it to be made of metal. When your wear it it's pretty comfortable with blue cloth padding on the inside. Overall I rate this a 4 out of 5 stars. This is a re release of an earlier UC item . I had the earlier version as well . This is exactly the same item only with a much better display base designed by Kit Rae . It is a very large and beautifully designed and detailed collectible piece . If you missed out on this item the first time around , don't miss out on this one , only 1500 being produced .